FILE - Afghan special police forces attend their graduation ceremony at a special forces training center in Kabul, Feb. 22, 2018. 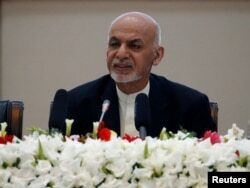 Afghanistan’s President, Ashraf Ghani has announced his forces will halt offensive operations next Tuesday until June 20 to encourage the Taliban to seek a peaceful resolution to the war. In a nationally televised speech Thursday, Ghani explained he has taken the unilateral move in response to an Islamic decree, or fatwa, top Afghan clerics issued earlier this week calling on all sides to stop hostilities to pave the ground for peace talks. “The Government of the Islamic Republic of Afghanistan announces cease-fire from the 27th of Ramadan (June 12) until the fifth day of Eid-ul-Fitr (June 19) following the historic ruling [Fatwa] of the Afghan Ulema (clerics)… Afghan National Defense and Security Forces will only stop offensive maneuvers against Afghan armed Taliban,” Ghani said. He added that the cease-fire is an opportunity for Taliban to "introspect that their violent campaign is not winning them hearts and minds but further alienating the Afghan people from their cause." The U.S. military in Afghanistan confirmed in a statement that they will honor Ghani's ceasefire with the Taliban. “We will adhere to the wishes of Afghanistan for the country to enjoy a peaceful end to the Islamic holy month of Ramadan, and support the search for an end to the conflict,” said Gen. John Nicholson, who commands U.S. forces NATO-led non-combat Resolute Support mission in the country. The United Nations Assistance Mission in Afghanistan has also welcomed the cease-fire. More than 2,000 Afghan clerics on Monday held a gathering in Kabul and issued the fatwa that outlawed the Taliban-led insurgent as un-Islamic and declared that suicide attacks are forbidden in Islam. “With the cease-fire announcement we epitomize the strength of the Afghan government and the will of the people for a peaceful resolution to the Afghan conflict,” said the president in his speech on Thursday. Afghan President Ashraf Ghani speaks during during a peace and security cooperation conference in Kabul, Afghanistan Feb. 28, 2018. However, Ghani explained that government security forces will continue to target Islamic State and “other foreign backed” terrorist organizations in Afghanistan. Expanding on Ghani's ceasefire truce, Afghan army chief Mohammad Sharif Yaftali later told a news conference his forces will also cease offensive operations against members of the Haqqani network "because they are also Afghan citizens.” This is the first time the government has extended its peace overture to Haqqanis who the United States has declared global terrorists. Taliban spokesman, Zabihullah Mujahid, when contacted for a reaction to Ghani’s temporary cease-fire announcement, told VOA it was too early for him to offer any comments. President Ghani offered unconditional peace talks in February under a comprehensive plan to reconcile with the Taliban. The insurgents have not formally responded to the peace overture but have since indirectly reiterated the Taliban’s stance that it will not engage in any talks with the Afghan government until all U.S.-led foreign forces withdraw from the country. U.S.-backed Afghan forces also have stepped up anti-Taliban offensive operations, inflicting heavy casualties on the insurgents and retaking some of the last ground during recent operations. The increased military activity against the Taliban is being undertaken since U.S. President Donald Trump announced his new South Asia strategy in August. The strategy aims to raise battlefield pressure on the Taliban to force it to come to the negotiating table with the Afghan government. 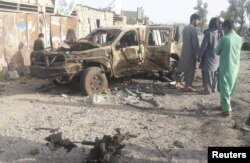 But analysts say that security conditions have since deteriorated across Afghanistan causing record bloodshed. Residents look at an Army vehicle which was damaged during battle between Afghan security forces and Taliban in Farah province, Afghanistan, May 16, 2018. The Taliban in response to Trump’s strategy has intensified attacks against Afghan security forces, killing around 500 of them in just the month of May, according to Afghan officials and local media reports. Nearly 200 civilians also died last month in conflict-related activities. The insurgency currently controls or contests nearly half of Afghanistan's 407 districts. The United Nations has warned Afghan civilians continue to suffer record levels of casualties this year. In 2017, a record more than 10,000 Afghan civilians were killed and wounded.